The Hankinson Family Grave which includes the name of Frank and his mother and father stands in St. Ann's Churchyard, Rainhill. Frank Hankinson was born in Sutton in 1884. He lived with his parents, Alfred and Ellen and 4 brothers at 1 Rainhill Waterworks, where Alfred was employed as an engine driver. By 1911 he was living with and working for Johnston’s in Old Swan as their bakery shop manager. He enlisted in the army in Knowsley becoming Corporal 1316 in the Household Cavalry and Cavalry of the Line (incl. Yeomanry and Imperial Camel Corps in the Lancashire Hussars). Little is known of his military service except that his battalion, 2/1st Lancashire Hussars war formed in September 1914 as a “second line.” By March 1916 it had moved to Culpar in Fife and the brigade was renamed as the 21st Mounted Brigade. He did not serve overseas. Frank died on 17th April 1916 aged 32, in the Third Scottish General Hospital, Glasgow. He was being treated for a broken right arm, thought to have been caused by the kick of a horse, but complications and infection set in. His father was at his bedside when he died and arranged for his body to be returned to Rainhill for burial. Although never serving abroad, his proud family thought to have the words "He died in the service of his Country" inscribed on the family headstone. Frank was interred in St Ann’s, Rainhill on 20th April 1916. He left £294 8s 7d to his father. At a special ceremony at the Warrington Road Cenotaph on Sunday 3rd July 2016, Rainhill village dedicated a new plaque bearing the names of 17 men with Rainhill connections who perished during WW1. These men's histories were found during Rainhill Civic Society's research. Rainhill Parish Council funded the plaque and organised the ceremony with Rainhill Civic Society, our local Churches and the Royal British Legion. 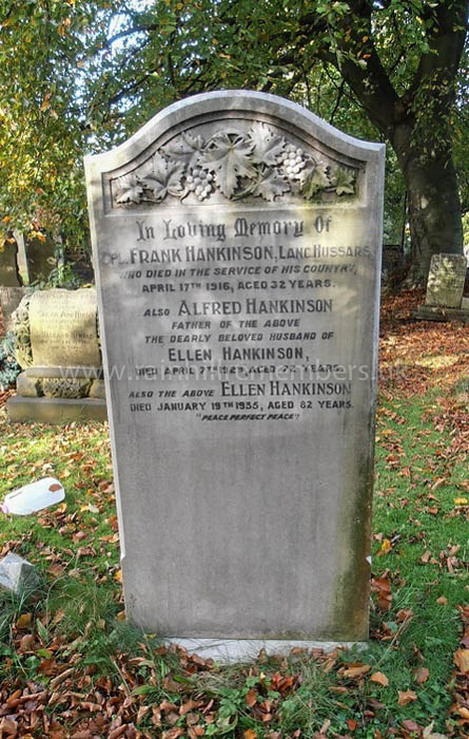 Frank Hankinson is one of those names.